You Are Here: Home » Depression » Could You Be Depressed? Everyone has felt down in the dumps at some point. For patients with depression, however, being sad or depressed does not go away quickly. The National Institute of Health estimates that about 15-20% of patients of all ages suffer from depression, but nearly 50% of them are undiagnosed. The cause of this is two-fold: 1. Depression has a bad reputation, and most people consider it to be a personality disorder or character weakness. In reality, depression is a biological condition that results from an imbalance of neurotransmitters in the brain. 2. Many people do not realize that the way they are feeling is not normal and there are treatment options available. Patients with depression can lose interest in areas of life they used to enjoy, including their family, their job, or hobbies. They may have gained or lost weight. Other symptoms include trouble sleeping, being tired a lot, feeling guilty or worthless, and difficulty with focus. At worst, patients with depression may want to end their lives. Depression affects both men and women, but women are two times more likely to be depressed than men. It can also affect children and run in families. Depression is more common in patients living in a nursing home, hospitalized patients, and patients with many health problems. Depression is not necessarily a year-round condition. Seasonal affective disorder, or SAD, is a condition that only affects people during a particular time of the year (usually the winter months). Individuals who are at increased risk of SAD are those who live in an area with long winter nights. There are a few methods utilized in the diagnosis of depression, but the first step is expressing your feelings to your health-care professional. Together, your clinician and your pharmacist can evaluate your level of depression and construct the best treatment plan for you. There are many treatment avenues available, including non-pharmacologic, pharmacologic, and natural remedies. Keep in mind, it may take several weeks to see the full effect of any medication for depression, so don’t get discouraged right away. Speak with your clinician or pharmacist regularly regarding any concerns. Depression is a life-long disease. While your symptoms may improve over time, it is important to continue to take your medication every day at prescribed. Do not abruptly stop taking any medication before consulting with your clinician or pharmacist. 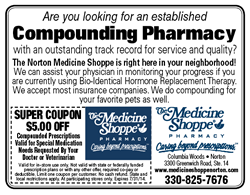 For help locally, contact your Norton Medicine Shoppe pharmacist. The process in which a trained pharmacist uses pure ingredient chemicals, special equipment, and advanced techniques to provide individualized medications.